It seems I have been taking an unintentional break from blogging. I have been so busy this last two months and my life has been a whirlwind of too many things to do! All is good in scooterpie land, we've just been hunkering down because the weather has been very wet this fall/winter, which makes it not inspiring to go trouping through the rain looking for photos and blog posts. The bikes are snugged in the moto lair waiting for warmer weather. I hope you are all well and wishing you the best for the upcoming festive season and a Happy & Healthy New Year! The blog has been a little slow lately, been busy, but also suffering from a lack of motivation - hello winter nice to see your dreary gray soggy rain ladened days. 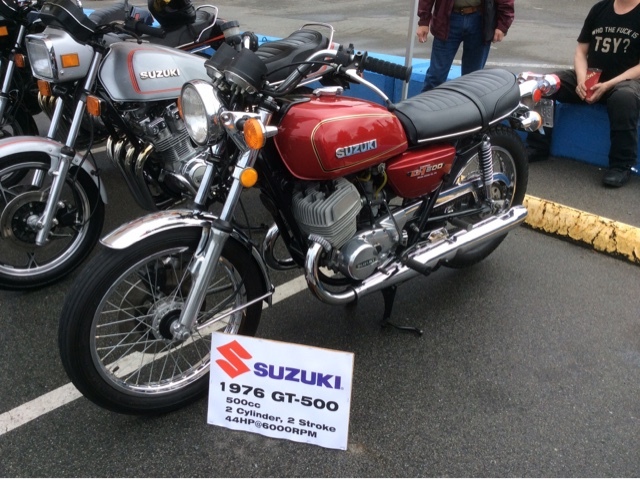 I did however make it to a local vintage Japanese motorcycle show at the end of September I met some very interestng peeps and one fellow in particular with a very old yellow goldwing. He was so animated and told me how his wife thinks the bike is his mistress. It was quite funny listening to him talk and tell stories of his bike adventures. Quite often when people think of vintage they think Harley, Norton, BSA, Indian and the list goes on. 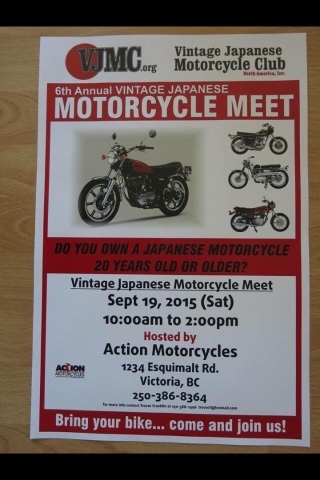 These bikes a beautiful in their own right, but there are a whole subset of bike lovers who prefer Japanese vintage. I do! 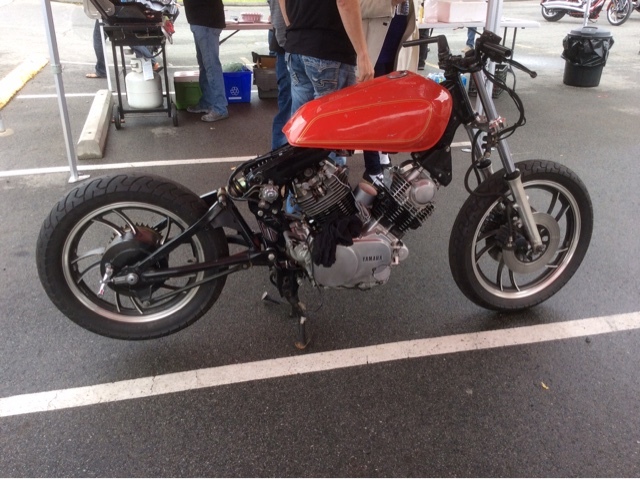 My first ever vintage bike was a 1984 Honda CM450 custom, that was my girl Lucy. Then came my beautiful Scarlett my 1985 Honda VT500e and then the wee little 1984 Honda CM250 which is currently in my name, but waiting for someone special to ride her, yup Scooterpie junior. 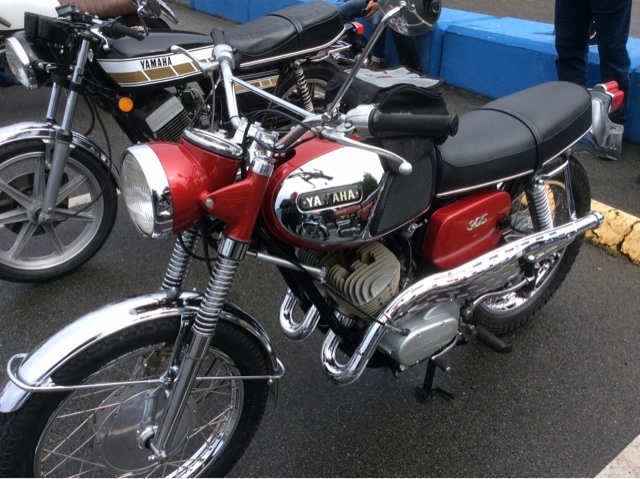 There is a certain appeal to Japanese bikes, the style, the innovation that was sparked in the 60s and 70s. Honda becoming known as Big Red was busy creating bikes for every level of rider and marketing them with lovely ads with slogans "You meet the nicest people on a honda" they were going after the suburban house wife, families and young people who had a new found spending power. 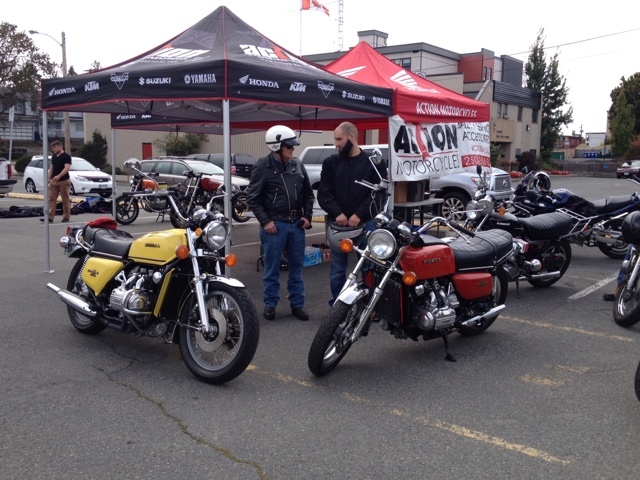 The fellow standing closest to the yellow Goldwing was regaling us with tales of his youth and his love of this bullet proof bike and he has traveled many a mile on this baby! Then the young'in pulled up on his red wing and they got into some serious bike chatter. 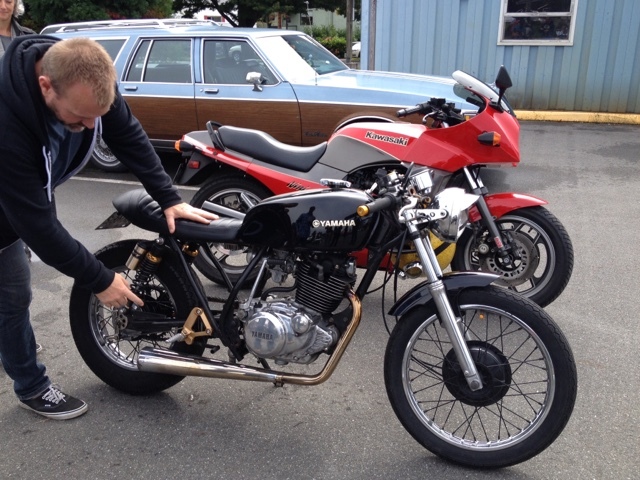 This beauty caught my eye, a father and son worked together to restore this beautiful bike. 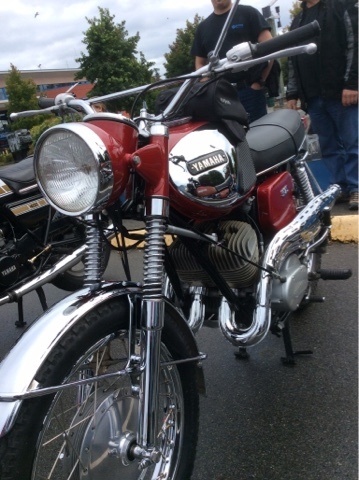 All of the bikes in the show were lovingly cared for, some still in original state showing their vintage patina. Still needing a bit of work. The winds of political change - here's hoping! (A very rare political post) Opinions expressed are my own. Canada has been going through some very harsh times politically, and I for one am glad to see an era of mistrust and divisive politics coming to an end. I am not saying that there will not be disagreement on Parliament Hill or debate when parliament reconvenes, but I am happy that the electorate chose a different path. Our Parliament and Senate have become dysfunctional, rampant with disrespect and the loss of civility. Canada was starting to become a country of fear and intolerance. Wedge issues were inserted into our political landscape in a campaign that singled out one religion. If we look back on recent history less than 100 years ago we have seen how religious and racial intolerance played out, yes I am referring to WW2. This may be an extreme comparison, but in reality this is how stuff like this starts, it has the potential to take hold and grow the seeds of hatred. I had hoped that Canadian's had grown enough as a society and world citizens to know this was a bad road to start going down. Former PM Harper was trying to pass this off as 'conservative values' or 'Canadian values', these are not my values or those of many Canadians. As a Canadian, I am ashamed that the PM who is supposed to represent every Canadian, no matter their gender, politics, or religious beliefs, tried to sell racism/bigotry/intolerance to Canadians, what's worse he almost did! He further divided the country with his actions and bad policy. The rhetoric he heaped out on the campaign trail hurt our country to its very centre and undermined the core values of Canada's foundation. We are a country built by immigrants. Every person who comes to Canada brings a piece of their heritage and culture with them. That is what is so wonderful about Canada, we are truly a diverse melting pot of humanity where everyone is free to practice their religious beliefs and be happy Canucks. I think Prime Minister Harper forgot that we have a Charter of Rights and Freedoms. He was taking us down the slippery slope of erosion of our rights and once that starts all bets are off and if we continued down his path the country that most Canadians know and love would in future be unrecognizable. 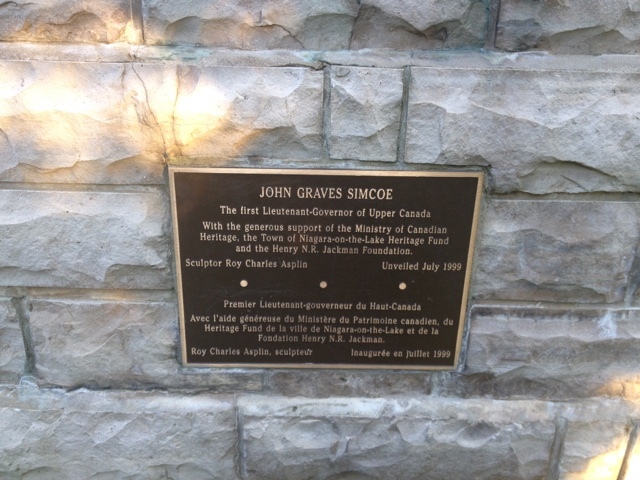 Canada traditionally has been a country of peace keepers and world citizens, we embrace people, we help them, we encourage everyone to be the very best person they can, we were a country of environmental stewards, but over the last decade and a half we have lost great standing in the world. We had lost our compass, we lost our ability to strive for peace and be global citizens and look after those in the world who need our help and those in our very own country who are struggling in their daily existence. Politicians pay lip service to veterans, they ask our service men and women to do the impossible and when they come home broken, politicians turn their backs on them. We owe these service men and women such a great debt, and in my estimation we can never repay them and that has to change. We need electoral reform for both houses of government; the Commons and the Senate. The 1st past the post system needs to go the way of the dinosaur and a system that represents every Canadian be established where a majority is not won by a party who only actually garnered 39% of the popular vote. Proportional voting would change the landscape of the make up of the House of Commons, and would be a truer representation of who Canadians voted for. A proportional system needs to be in place to ensure all Canadians coast to coast are fairly and equally represented. As a West Coaster it is very dispiriting knowing that before BC polls are closed the election has already been long decided. We are the last Province to go to the polls and the rest of the country has finished voting and votes already counted a good 4-6 hours before our polls are closed and our counting begins,there is nothing democratic about that. In the case of this last election people engaged in 'strategic voting' which generally happens when people want change and vote to boot out the current government. We have seen political routs before both Federally and Provincially due to this type of voting, proportional voting would eliminate the need for people to think about strategically voting. Politicians need to understand that they are accountable and Canadians will expect no less than their very best, serving as an MP is not about furthering party agenda or personal vision, but rather it is about working for every Canadian. As a Canadian I am saying to those elected - I expect you to be and do better, I expect you to be honest, I expect you to understand the privilege and trust that has been placed in you in regards to your elected office, you are stewards of this country. Mediocrity is no longer acceptable, nor is partisan politics or politics of fear and division. The purpose of the senate is to represent all Canadians, it is considered the house of "sober second thought" with regards to legislation. I am hoping that civility will return to both political houses and that partisan politics will not be the game of the day in the conservative stacked senate. Along with electoral reform I also feel that there needs to be senate reform, particularly when it comes to appointment of senate seats. Senate appointments are made at the discretion of the PM and we end up with an unbalanced senate that plies the trade of partisan politics, which makes the senate biased and relentlessly pushes the agenda of the party with the most seats. This partisan politics takes away the purpose of "sober 2nd thought"and effective governance. The senate in no way represents Canadians and I honestly feel senators should be elected and represent each province equally or it should be abolished altogether if reform doesn't happen. Unfortunately to do this a minimum of 7 Provinces would have to be on board to re-open our constitution. We've been there before in the 90's and it almost had disasterous results and the country almost splintered apart. But then again if citizens are ready for change and were given thoughtful viable options it may just be possible, but it is going to require a lot of work and vision to make it happen. One of the best things about this election was voter turn-out it was the highest its ever been and the youth vote was finally mobilized. Finally young people in the 18 to 35's age group are getting engaged in the democratic process and that says a lot about the state of our country. I may sound very dispirited, but actually I am not, I still see what is great about our country and the huge potential we have to make change in our country and in the world. 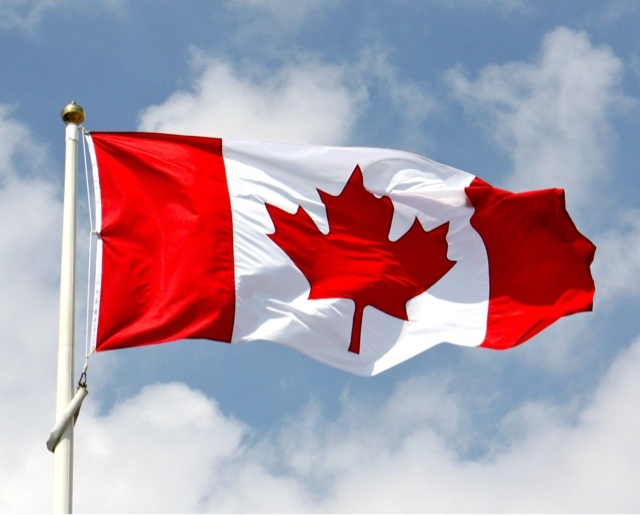 It is going to take a lot of work to make us all feel that we are worthy of our Canadian traditions and increase our standing in the global community. It is not just up to politicians to inspire change, it is up to each of us to foster it and grow it in our daily lives. Dare I say we have the makings of a Canadian Camelot, I hope it isn't just a mythical place, but a modern day Canadian reality. Time will tell if PM Trudeau will live up to his words and platform, as Canadians it is our job to hold all politicians accountable and to stay true to our Canadian identity. One last summer vacay post! Its been hard to post lately, but finally the last of my summer vacation pics. 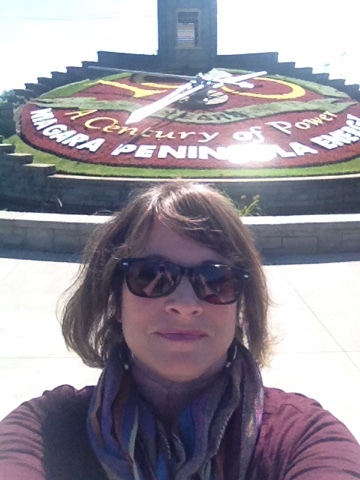 We had a wonderful time in Ontario visiting with family. We did quite a bit of sight seeing showing our daughter her dad's roots. It was wonderful! 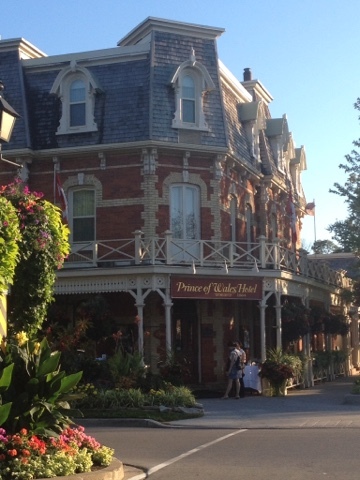 Our nephew took us on a lovely tour of Niagara on the Lake. 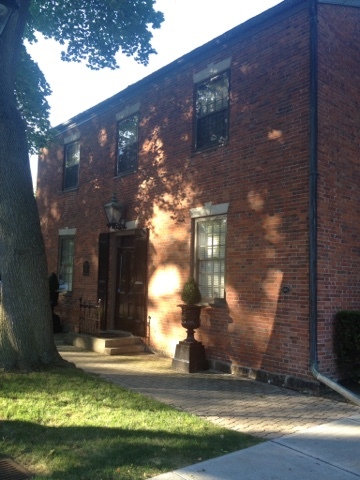 It was beautiful and I was so enthralled with the heritage homes dating in around the 1800. 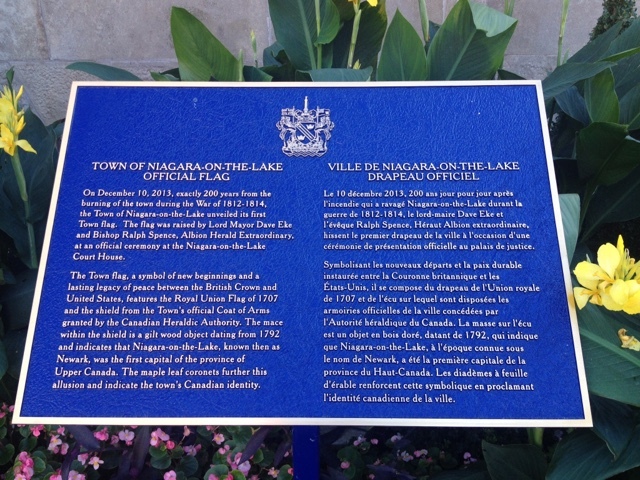 When I stood looking down the main street I could picture women in their long dresses strolling down the street, a very romantic notion I think, but in reality it was a very turbulent time in Canadian history with the war of 1812 raging. 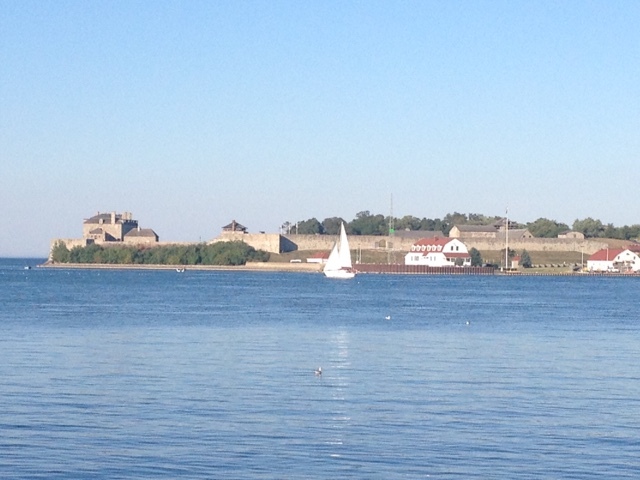 Fort George was heavily fortified protecting the area from invasion. 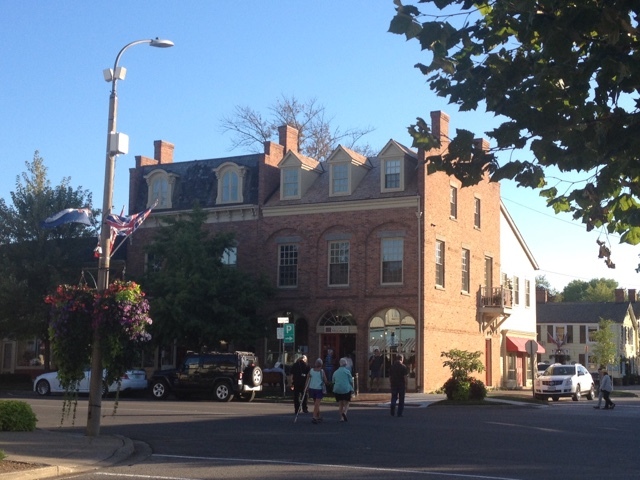 I love the architecture of this period and I fell in love with brick houses. We don't have too many brick houses in Victoria. 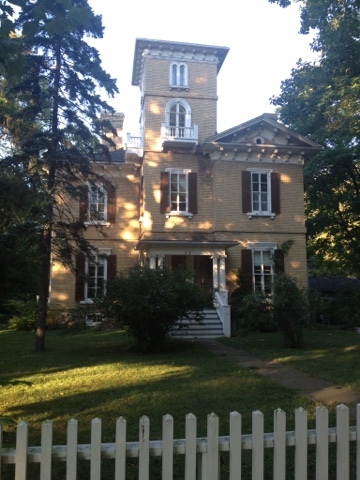 This house dates from the mid 1800's, it was beautiful, my neohew was telling us about the restrictions that are pkaced on heritage homes in terms of renovations, colours that can be used. I am not sure I could live with that sort of thing in my life, but then I am more of a free spirit and don't like to be too constrained. 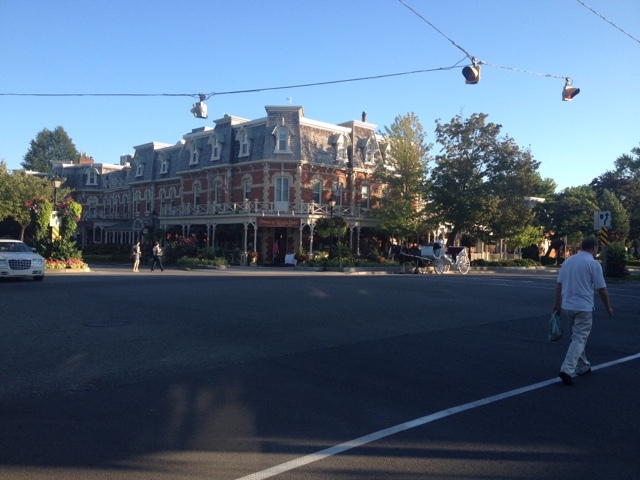 Very picturesque, warm weather and people liesurely strolling along on a late summer evening. Probably as I write this now the leaves have turned are are well on their way into fall and getting ready for a winter nap. The fmous Prince of Wales hotel, apparently when Prince Charles and Diana Princess of Wales visited Canada they stayed in this beautiful heritage establishment. The Her Maj Betty Windsor has also visited Niagara on the Lake and attended church on Sunday. 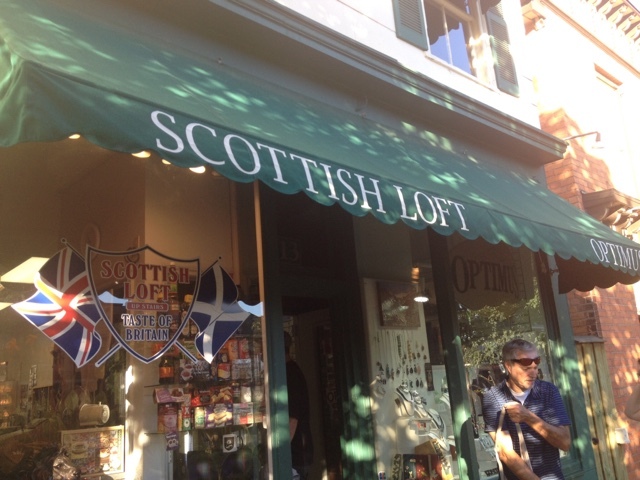 We were in search of sweeties and a bit of our Scottish ancestry, we found our clan badge and tartan, our clan moto Disce Pati which translates to 'Learn to Suffer' or 'Learn to Endure'. I was hoping for something a little more uplifting. We do however have our own tartan plaid which is a lovely blue and green. According to family sources we are also able to wear the Robertson and Taylor plaids due to family affiliations. 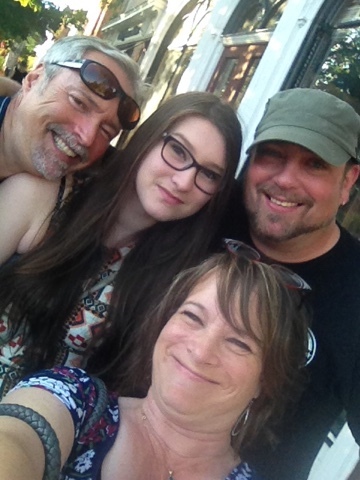 A family selfie, the young man is my nephew, he IS the coollest dude! I am so proud of my two nephews and niece, they grew up to be amazing young people, artistic, creative, caring and good kids. We wandered around and thoroughly enjoyed our walk through time. 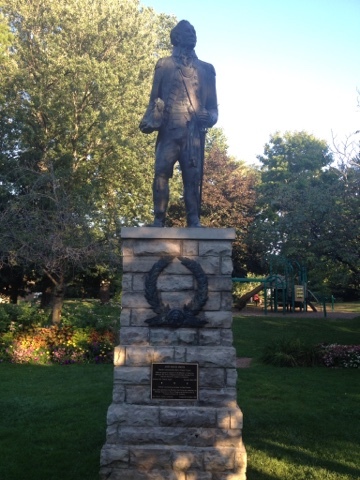 One the statues in the public park, this being John Graves Simcoe, Lt Govenor of Upper Canada. 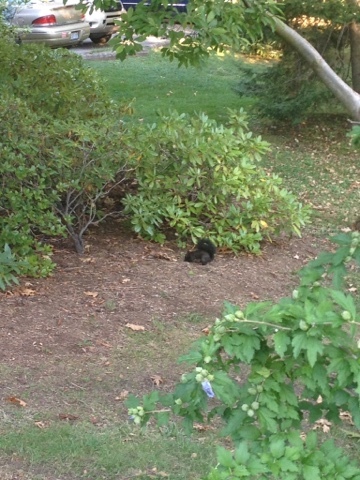 Lovely little black squirrel, we only have grey and brown squirrels in Victoria. 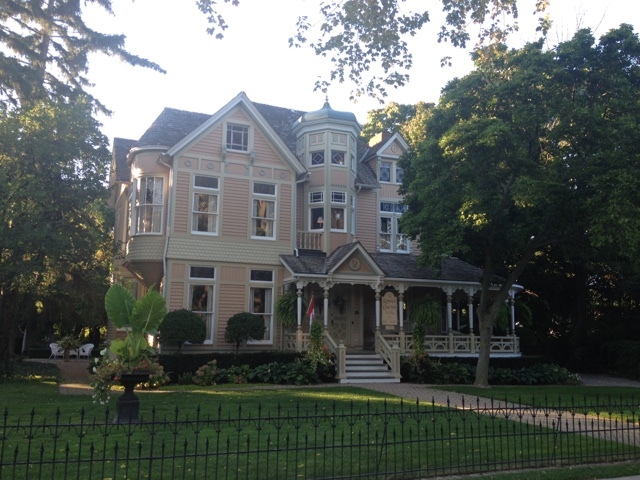 Another lovely heritage home. 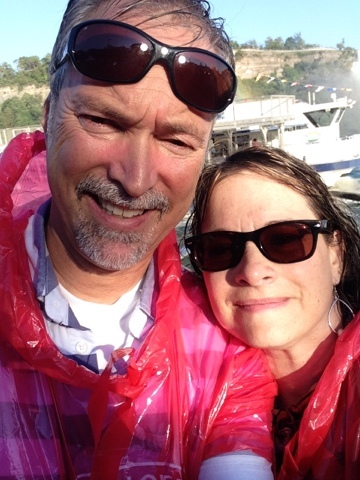 We thoroughly enjoyed our visit to Ontario. I have to say if it weren't for the winter I'd move there. The housing market in the smaller communities is much more family friendly than Vancouver Island. 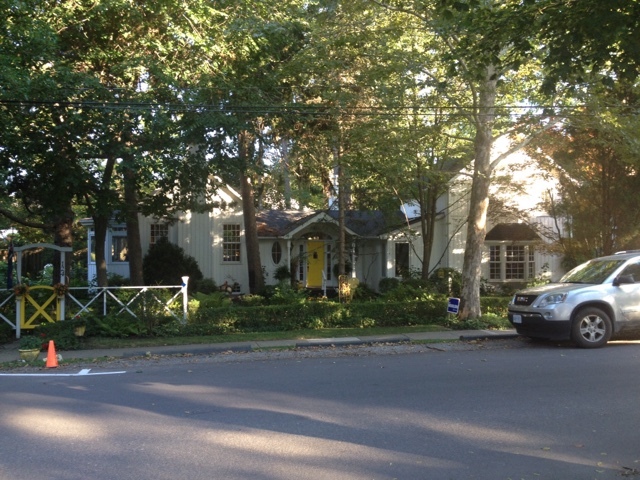 Here the average starter home is around $400 to $500k, we could actually buy a pretty luxurious home back East. In any event it was an amazing holiday and I hope we can go back soon. Just a quick post of where I'm at right now, I haven't been posting much because I've been pretty busy. 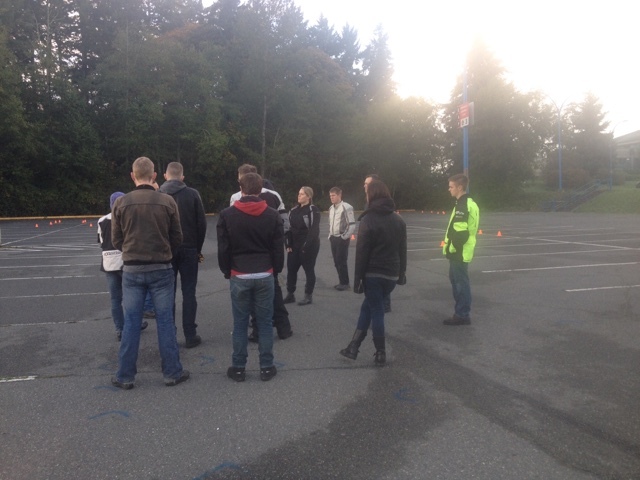 I just taught the last motorcycle class of our weekend teaching season. 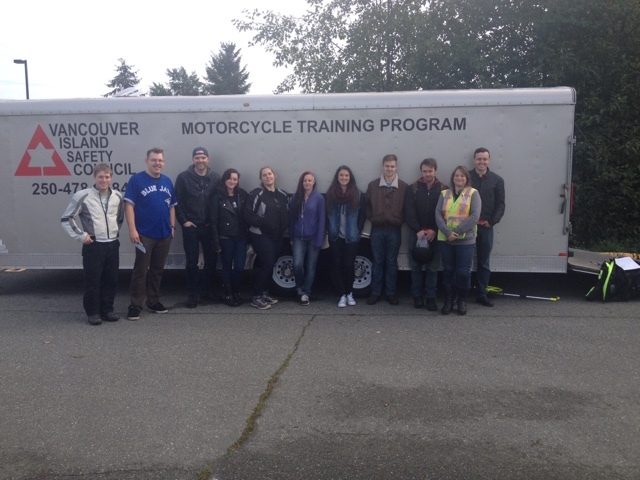 It has been two full weekends of hard work and great satisfaction seeing 10 new riders heading out to start their motorcycle adventures. It was pretty challenging this weekend with it still being dark at 7:00am and pea soup fog compounding the situation with poor visibilty and very slick asphalt. I am always in awe seeing 10 people who for the most part have never touched a motorcycle and watching their skills grow and strengthen as novice riders. Its pretty remarkable to watch the transformation, its like watching a butterfly emerge. Students are getting the lay of the land and instruction about MSA test expectations. 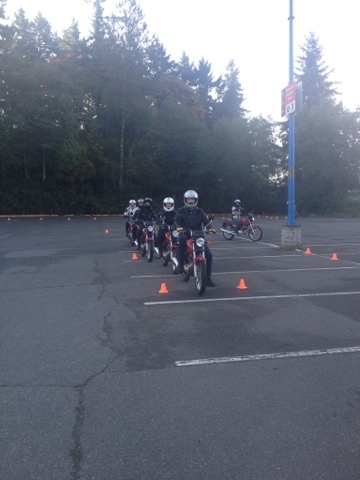 It was coincidental that on Friday facebook sent me a memory from October 7, 2011, that was the moment in time when I was finishing up my novice class and stressing about riding the motorcycle skills assessment test (MSA). Wow how things have changed! Part of my duties as an instructor is to do a riding demonstration of the test layout. My partner instructor was there at my beginnings of instructor training last year and he remembers how much I used to stress about riding the MSA test. We both laughed about it today after I rode the demo, he made me smile when I heard him say to our students "That was a clean test, there were no faults or demerits." Lined up waiting to ride the uturn box. I have heard several times from students that they couldn't ride the test and its stressful and then they say, "There is no way I can do what you just did!" I get how they are feeling and if they only knew how recently I actually did this very test in their situation, they'd know that understand those feelings. I reassure them, tell them these are skills they have learned and that there is nothing new to them. I also reiterate that it is continued practice that allows me to ride the test clean. I can't help but smile and think back 4 years ago and I am thinking to myself as each of my students rides the exam "Wow that was me 4 years ago!" This was the best way to spend a long weekend. To top off my excellent weekend we had Thanksgiving and are all in a blissful food coma in my house and I get to sleep in Monday! Catching up on the rest of the trip! Well, it's been two weeks since my return from my fabulously restful busy vacation! At the end we were doing so many things and the internet was spotty that I decided to unplug from the digital crack. I have to admit that I enjoyed it more, I actually long for the days of pre-cellular phone/camera. I do enjoy documenting things, but at times it becomes obsessive. Anyway I did manage to take photos, but haven't had a spare moment to post until now. 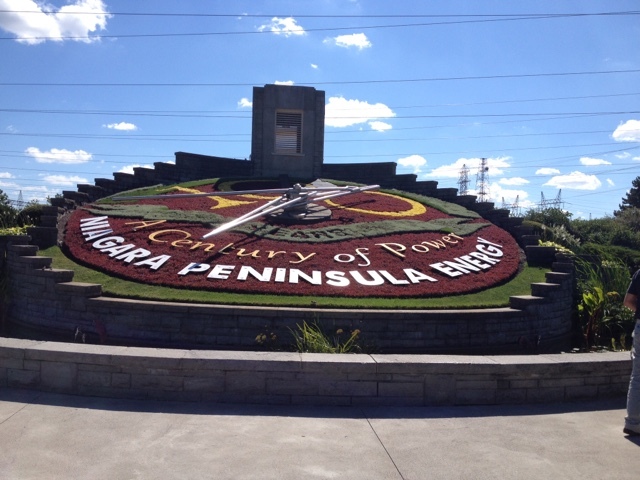 We started out checking out the Floral clock. I had to wait for a group of tourists to take a group shot, which I actually helped orchestrate. Yup always got to bed in the heart of the action! I was standing behind the photographer/tourist looking at the group and waving and getting them to say "cheese" so they'd smile, then I got the photographer to go sit with the group and I took pics of them. Then they had me sit with them. After that I finally got my picture! So let me explain the 'selfie obsession' when I am wandering its usually solo and I like getting a pic with something interesting, but usually moto man is off taking his pictures. I used to turn the camera around & try and snap pics, but the iphone makes it simpler. In most of our family pics I'm not in them because I'm the picture snapper, I usually mess up the self timer business. Anyway back to sightseeing. 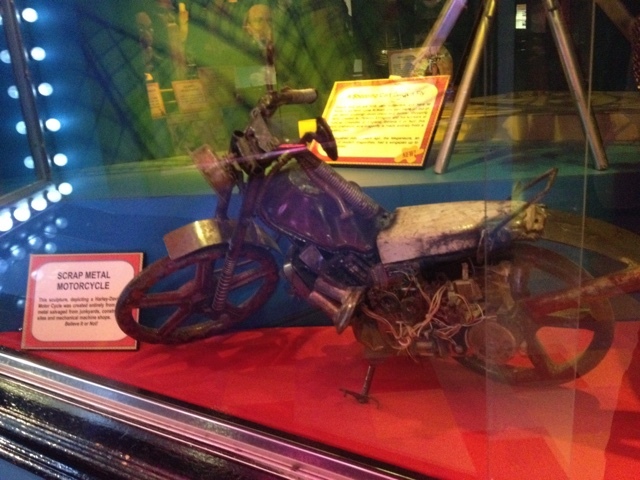 Scooterpie Jr wanted to go to the Ripley's Odditorium in downtown Niagara Falls. 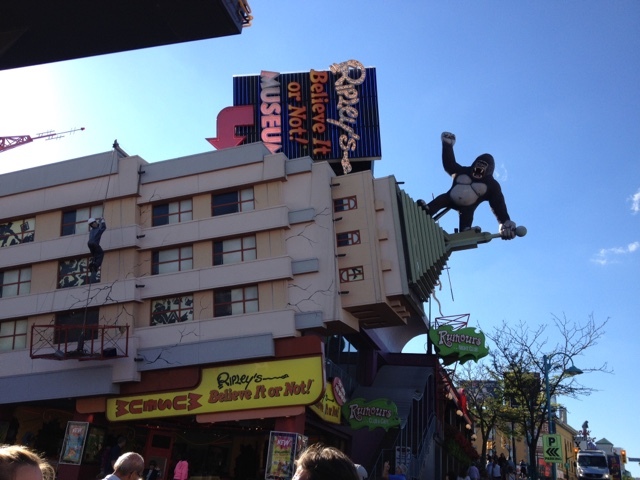 We spent the better part of two hours wandering through this strange collection of eclectic stuff. We actually quite enjoyed it and found it interesting. I tried to bug out my eyes, of course you knew I'd have to be goofy! Moto man just shakes his head and shuffles off. 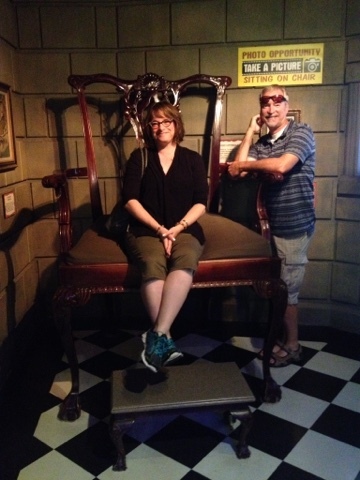 We took a picture in a giant chair which belonged to an extremely tall gentleman. His shoes were massive. 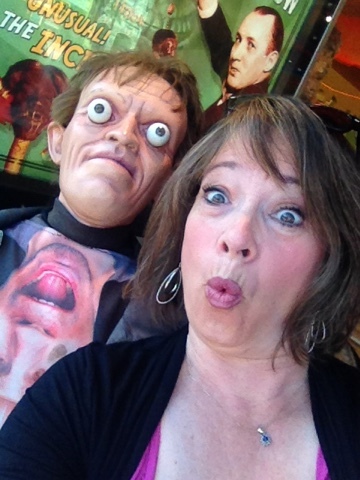 We saw a great deal of weird stuff, there were shrunken heads. Incredible art done on the head of pins and in the eyes of sewing needles. Two headed animals, have to admit some of the stuff weirded me out, but its fascinating to see what Mr. Ripley collected. Found this cool little motorcycle made from scrap. 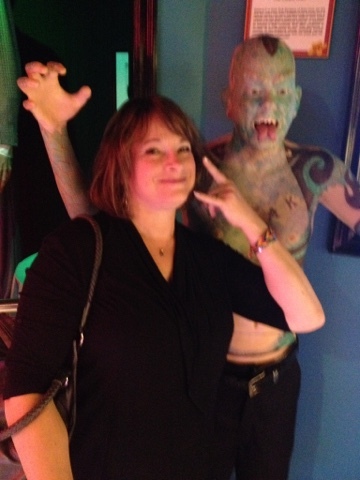 Of course I had to take a pic with this chap. 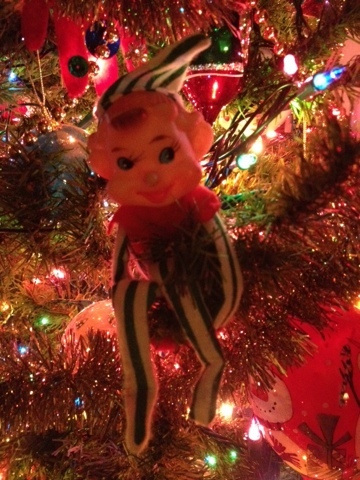 There truly are weird, wild, and whacky things in this Odditorium. After the museum we wandered around a bit more & had a snack. I was on a quest for coffee that wasn't Tim Horton's, I finally found a Starbucks and had a double shot Americano, which was twice the price of the Starbucks at home (tourist inflation at its finest). 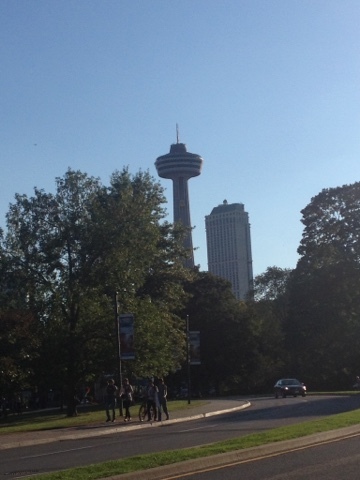 This was our landmark in Niagara Falls, the Skylon Tower, as long as it was in sight we weren't lost, (which hapoened a couple of times because someone wouldn't ask for directions). Thank goodness for google maps! 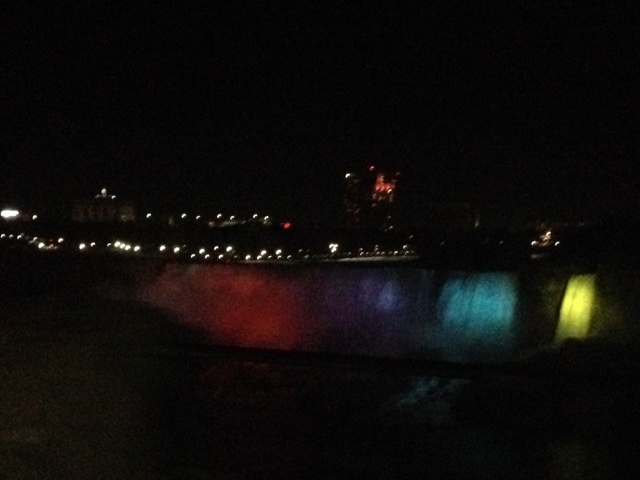 At the end of the day we drove by the falls, they light them up, but due to the parks police ever hovering we couldn't stop to take a decent photo. So it was a drive by phone out the window, fuzzy shot, at least I managed not to drop the phone. After that it was time for bed. When you live in a tourist destination and were to ask the locals "Do you do tourist type activities?" Most would reply "No". I know this, as I live in a tourist town and most of us stay away during high season for the most part. 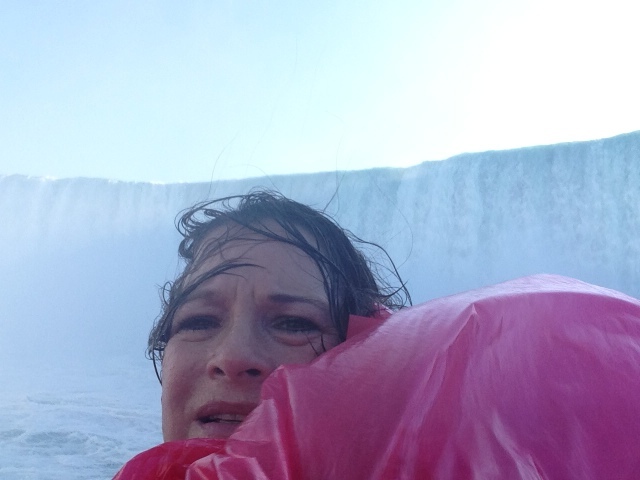 On our first day of being Niagara Falls tourists we did a lot of activities, everything I have posted in parts 1-2-3 were all done on Monday. It was a busy day indeed! 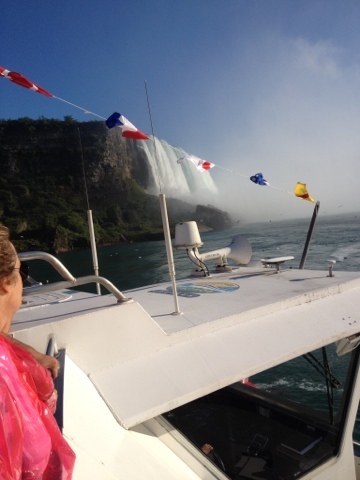 We decided to do a cruise at the base of the Falls, most would commonly recognise the name 'Maid Of the Mist', but on the Canadian side it is called Hornblower Cruises. We paid our $20 CDN and sailed off into the mist. We donned the signature plastic raincoats, have to say if you think you are going to stay dry its a fantasy. I look like a little sunburned smurf in this oh so attractive designer garbage bag. 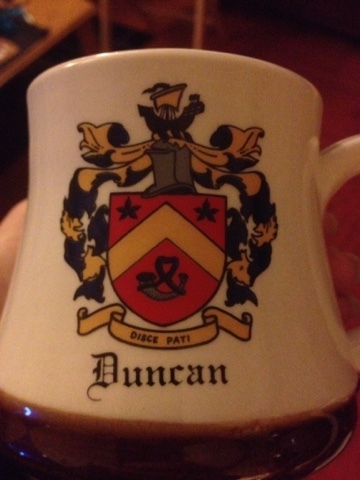 Here I was actually dry! In another 2 minutes I was soaked, a tip for those who are contemplating doing this make sure your camera and other digital devices are in waterproof cases, for the girls waterproof mascara is the way to roll, there were a few ladies who when they got off the cruise they looked like Alice Cooper at the end with mascara running down their faces. Have to admit this was the best part of the tourist experience, it is not every day that you are able to get this close to one of the most magnificent water falls in the world and experience the raw power of nature. I was pretty excited and I was very glad I did this and would do it again! 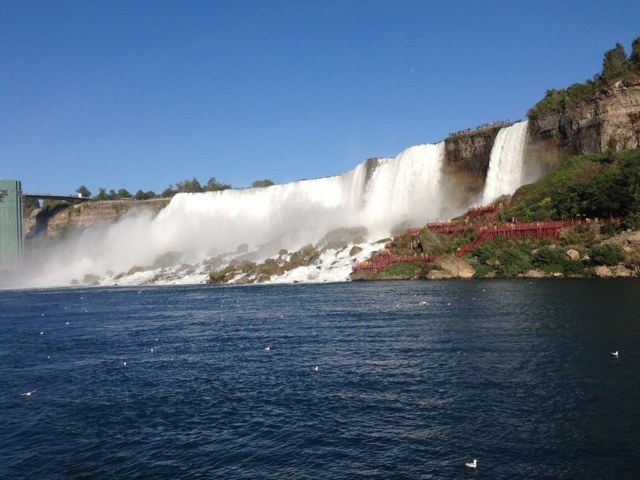 American side of falls and Bridal Veil falls -simply stunning! 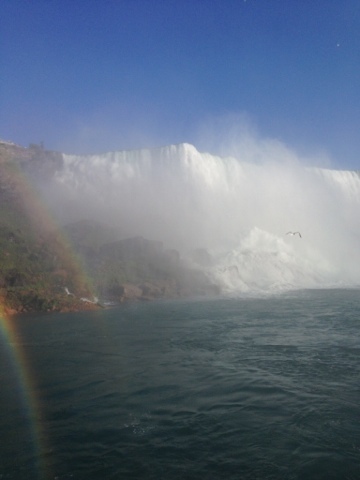 Niagara Falls consists of three falls, there are two on the American side, Bridal Veil falls and the American falls. 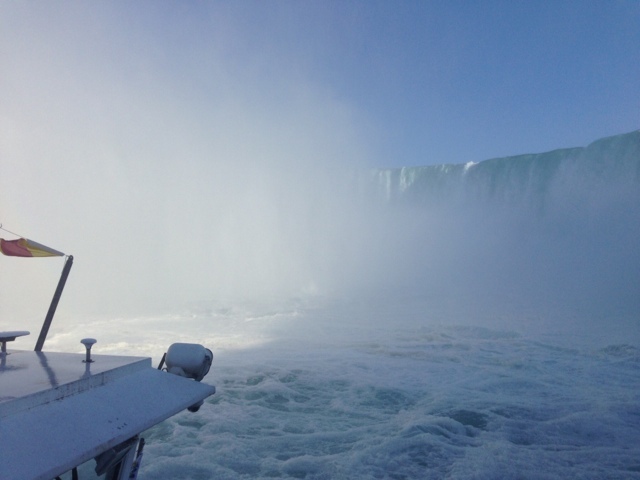 Then we come to the biggest portion of the Falls which is on the Canadian side, it was named the Horseshoe Falls in 1721. Horseshoe Falls isn't one of the tallest or biggest waterfalls in the world, but due to the amount of water that runs over it, approximately 168,000 cubic m of water with the equivalent of 750,000 gallons per second falling 52 metres (170ft) into the basin that makes it one of the most powerful waterfallsin the world and it is a key component of hydroelectric power generation in Ontario. The Horsehoe Falls are located between Table Rock and Goat Island. 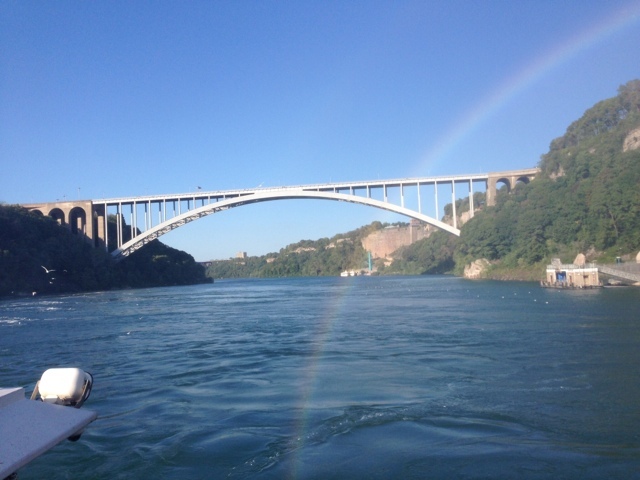 The length of the Niagara River is 58km. 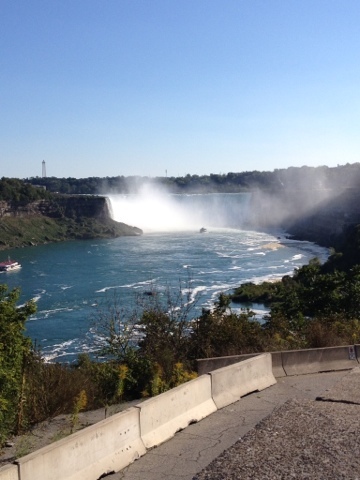 Here is a shot of the American Falls and to the extreme right Bridal Veil falls. 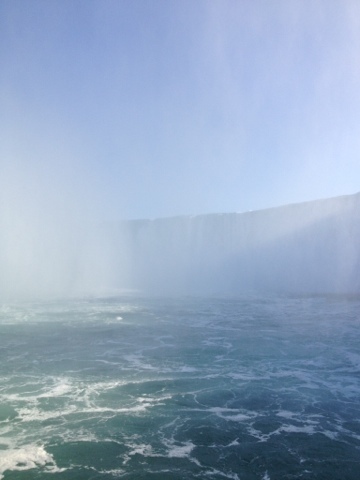 At this point you could hear the roar from the Horseshoe Falls and we hadn't hit the mist yet. Rainbows were dancing off the water and it made it even more enchanting. Weare heading towards Horseshoe falls, the water was starting to get a little choppier and we were getting wetter. But it was very charming and there was a feeling of romance with it. The legend of the falls is that a young first nation's maiden was sacrificed & was sent over the falls in a canoe. 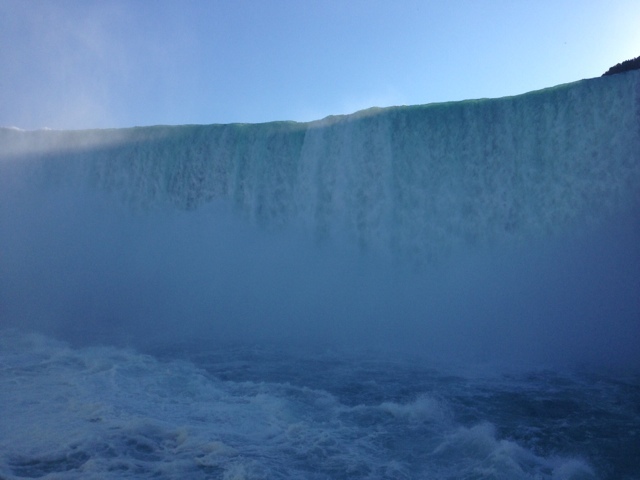 They say if you listen to the water you will be mesmirized, pulled in and plummet over the falls. There was a lot of squealing about being wet from many a passenger. I was standing by a young couple and I have to say watching young love blossom was very touching, oh the days to be young and giddy with love. It was very sweet, the young man kept saying to me "I promised my girl I'd bring her here." All this was happening as moto man was wandering around taking pictures. Here we are about to head into the mist and at this point all hopes of staying somewhat dry are dashed. The mist also make it extremely difficult to take good pictures and I actually gave up, as did my iphone, it shut itself down, luckily it restarted! 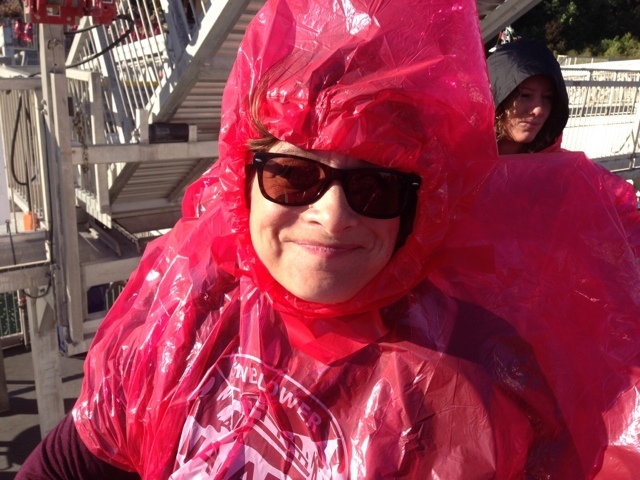 You can't tell from my expression, but I was truly enjoying the adventure, I was just having an issue trying to work around a windswepted poncho to snap a pic. I looked like a drowned rat. The roar was deafening! Ear plugs would be a handy thing to have, at this point the water was very turbulent, but it was nothing you couldn't deal with. 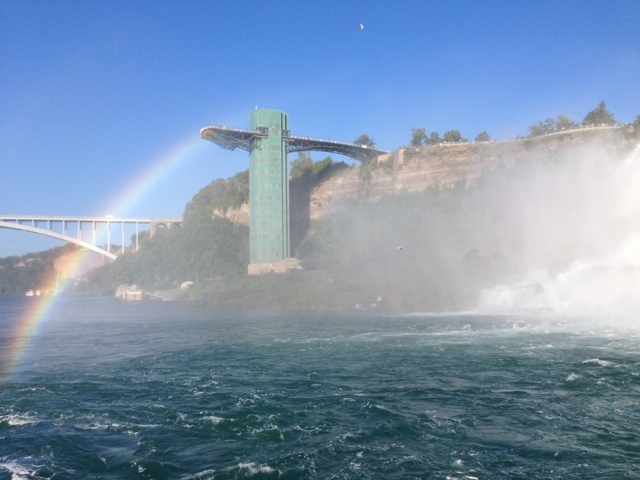 Coming back out of the falls. Looking back down the gorge there is an observation platform and there is a story behind this, apparently it was supoosed to be the new bridge, connecting the US and Canada and part of the plan was for it to be a joint effort between the US and Canadian governments, but something happened and the bridge was not completed. In any event I caught one of the many rainbows. The cruise was drawing to a soggy close, but every face you looked upon was beaming with joy. Heading back to calmer waters. 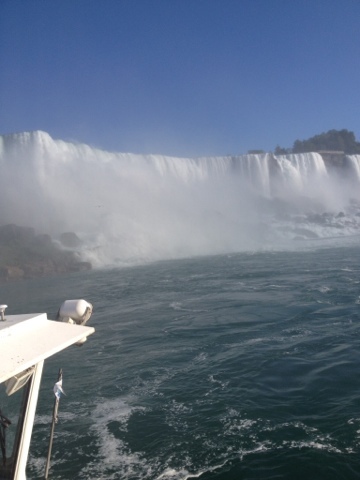 We thoroughly enjoyed our cruise through the mist and I would recommend doing this activity, it was amazing seeing the falls from above and from the Ferris Wheel, but it is completely different when you are so close, the magnitude of it is overwhelming.than It was thrilling to see just how powerful the falls are. 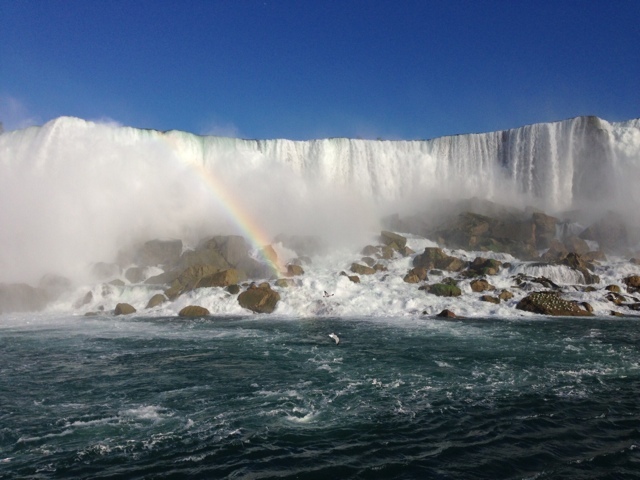 A few things i would recommend, wear good walking footwear, don't carry a big bulky handbag, make sure your electronics are protected from the water, most importantly enjoy one of Canada's most magnificent wonders! This was an awesome day!